"After all that second quarter pressure I'm delighted for it to be 10-10 at HT. All to play for. #COYBIB #GLAvLEI"
The above tweet was composed but never sent from the @HarpinOnRugby account, though my finger was hovering over the 'enter' button for a while. It's hardly as though I planned to jump the gun - Stuart Hogg had just tried to use his rocket launcher of a boot to give his side the lead from inside his own half...it had the distance yet not quite the accuracy. So when Johnny Sexton was drop-kicking the restart from his own 22, the clock read 39:34. Surely what came next was for Glasgow to rumble through a few phases to see out the half. Nobody told that to man-of-match Rhys Ruddock, though. Yet another booming tackle on the end of yet another burst of lightning-quick line speed not only pinned the Warriors back in their own half but also forced a knockon as the clock said 39:54, which meant the scrum had to be taken. Then we had the Leinster pack who were clearly not savouring the prospect of halftime oranges just yet...a powerful drive coupled with the ball expertly held in by the boots of Jack Conan had referee Jerome Garces stick out his arm for a penalty advantage as the clock said 40:48. Nice one, I thought. Despite the relatively low stands around Scotstoun making the heavy winds difficult to navigate, Johnny should pop this over and give us a handy three point lead. I began mentally preparing a different tweet reducing those thoughts to 140 characters including the appropriate hashtags. As the clock says 41:56, ie without enough time to overthink our lineout call, Sean Cronin hits Devin Toner at the two position and the pack swarms around him to set up a maul. We're just inside the 22 so there's a fair way to go, yet when Cronin tucks the ball under his arm, the forwards who had smuggled it back to him begin to shove and get up a head of steam. Then as some peel off they join from behind him, he shifts it to Ruddock; by now there's no stopping us - there's one final hand off to Healy and with the clock now saying 42:22, he falls over the line for his second try of the match. What's that you say? You think this meticulous telling of this 'extra time' action is done? Lord, no. Remember that ghastly Glasgow gust I was harping on earlier? Sexton already had one conversion barely creep over off the upright so this one, from the opposite side yet from a more difficult angle, needed something different. Mark Robson in the Sky commentary box suggested a mis-kick as it took a low trajectory over the posts inflicting the maximum damage on our hosts. We Leinster fans know he meant it, as the clock said 43:49. "Great second quarter from Leinster withstood a lot of pressure then made half a chance count. Glasgow far from done tho #COYBIB #GLAvLEI"
That's how the tweet ended up; and having watched the match back I now realise I was totally underselling what the boys in blue white and light blue checks had just done. For up to that 22 drop out, the match had been proceeding exactly as all the experts had predicted. And what's more I agreed with them ha ha. Glasgow struck the first major blow, playing with their trademark high-risk style and a couple of neat little grubbers through the Leinster defenders was finished at the last possible moment by Stuart Hogg before it went dead. Yet it wasn't long before the returning Scotland and Lions fullback had the first of two overcooked punts that went astray - no doubt buoyed by his score he was hoping to punish a Sexton penalty that failed to find touch in the corner...Hogg launched it about 10m in from his line and a combination of his boot, the 4G pitch and possibly the wind as well meant it went dead bringing the play all the way back where he started for a Leinster scrum. We still had to convert it though, and once more it was the pack to the fore with a series of phases, clearouts, another penalty and another lineout/maul - at one point as Cian Healy approached a ruck and you'd almost think he was pointing to the precise part of the tryline where he wanted to dot down before doing just that. So like I say, it was a contest every bit as even as the ten-all scoreline suggested, although to hear the Sky commentators' narrative du jour, we surely had to be doomed because we weren't able to tackle. I could go on about this for many, many paragraphs so I'll try to keep this brief. Leinster defend to a very rigid system. Part of that appears to be hitting ball carriers high enough to wrest the ball free yet low enough not to be pinged. That involves an immense amount of risk, yet it also seems to involve trust in the ability of your team-mates to pick up the pieces should you meet the statisticians' definition of a 'missed tackle'. The pundits were obsessed with the fact that as a team we missed 34 against Montpellier's monsters last week, and referred to it every time we missed one this time around. Yet despite this apparent failing, we somehow managed another bonus point try win, ironically posting 34 points in the process. Look...it's not like my goggles are so blue I refuse to point out Leinster's failings...the lineout has been a bugbear for a long time, and in the second half we had a couple more go wrong as James Tracy struggled to get his darts straight after he came on. And of course missing tackles is never a good thing in rugby, and it's something that needs work - it's just as is often the case in sports, the raw stats mean little without context. And as if to prove my point, Leinster's D held out a Glasgow side that seemed determined to even things up right from the second half restart. They got as far as our line only to ship a penalty at the breakdown - it was this inability to convert close quarter chances that was really their downfall, though despite what 'Messers' [mis-spelling intended] Robson and Barnes were saying, in general our line speed and targeted pressuring was top notch. On that topic of line speed...maybe some could argue that we were too quick at times. To that I'll say that perhaps the Glasgow clearing out was too efficient at times. I remember a time when diving head first off your feet over a ruck was a penalty, yet I see it all too often now. Both sides were flirting with the edges of the Laws in areas they wanted to dominate, in fact most teams do. Then having held out our hosts, we proceeded to march up the field in search of try number three. First, yet another impressive maul after the penalty gives us front foot ball in the Glasgow half. Then, Luke McGrath bounces off a tackle, charging into the 22, handing it off to Sexton who gets it to the 5m line. Somehow the very same forwards who had just done that spot of mauling arrive in time to help clear out. From there we rolled through 15 phases of carrying and recycling before Sexton executes what can only be called a 'Wraparound Deluxe' move with new dad Scott Fardy as the Wallaby's improvised return pass was special to say the least, giving our outhalf and skipper the space to power through and score under the posts. Glasgow weren't done and came right back at us with an impressive phase sequence of their own before sweet passing on the run from Horne and Hogg found Seymour in space to finish...the winger rarely fails to find his name on the scoresheet against us. But try as they might to peg us back further, all they could manage was a penalty on the 66th minute mark [one of only 5 we shipped on the day, surely a more noteworthy stat than missed tackles all things considered] and from the restart, our forwards got a stranglehold once more, literally in this case as Ruddock, Conan and Ryan forced a choke tackle before we won a penalty at the resulting scrum. When Sexton nailed the placekick he was substituted as if to suggest we felt the match was won...I reckon Leo, Stuart and co had that about right, but we weren't quite done yet. 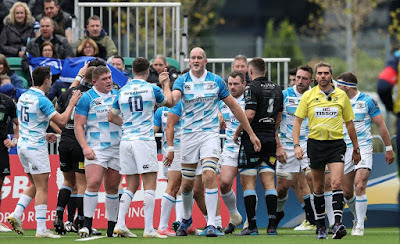 While it was starting centre Noel Reid who spotted a gap between tiring Glasgow forwards for a bonus point try we had hardly thought possible at kickoff, there was great work from our bench in the build up. 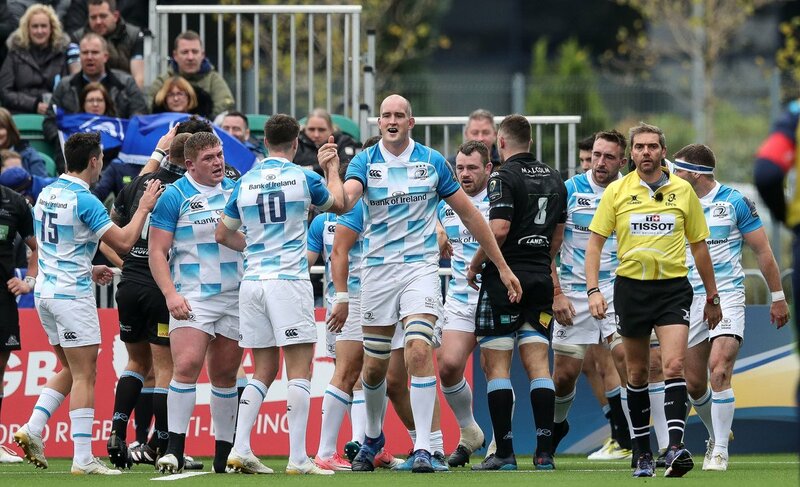 After a perfect start to their Pro14 campaign, Glasgow will be disappointed with no match points from their opening two matches in Europe. I felt they were lacking in the pack and while they were unlucky to lose skipper Ryan Wilson early on and both Callum Gibbins and Stuart Turner right before our BP try, they still missed influential locks like the retired Kellock and the 'now at Racing' Nakarawa. Back to harping on Leinster...how on earth can we be anything but happy with a maximum ten points out of ten? Sure, we've two tough away matches to come in the league, first in Belfast and then back at Scotstoun where I'm sure the Warriors will be looking for revenge, with a pool-deciding back-to-back series with Exeter to come in December.